It's brilliant, really. You often hear of health-conscious people boiling camote tops or lemongrass for their properties... so why not bottle them up indeed and serve cold? 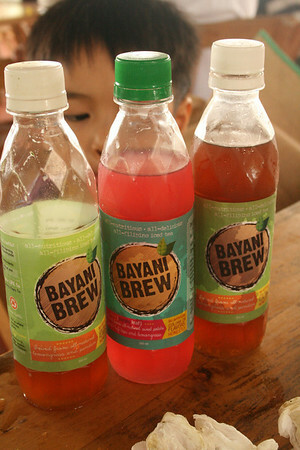 Bayani Brew is yet another product coming out of the Gawad Kalinga farms. There is the lemongrass variant (which tastes more like regular iced tea, because of the calamansi mixed with the lemongrass and pandan) and the purple tea (made from camote tops... haha... it was like drinking a very weak and cold sinigang broth but I still liked it). So, if you want to offer refreshing drinks that are truly healthy and unique or want to also offer these in your restaurant, contact directly through e-mail at bayanibrew at gmail dot com.